I’ve always had a thing for lemon poppy seed muffins. Why I’ve never made them, I’m not sure. The extra stress of shopping for poppy seeds? Who knows. So when I was assigned to Traci’s Burnt Apple blog, through the Secret Recipe Club, I knew exactly what I would be making. I absolutely love Traci’s honesty. In her introduction, she admits to making a muffin so hard her husband tossed it through the wall, literally. She couldn’t cook. Yet her determination and growing family, forced her to take on the challenge. Burnt Apple is filled with healthy recipes, but unless you read the recipe, you’d never know. Everything just looks so tasty! I played around with Traci’s recipe a bit and lucked out with the measurements. Her recipe made 2 loaves, which is perfect for a family of 5, yet a bit much for just my husband and I. The problem was 3 eggs. If anyone out there has found a way to split an egg in half for a recipe, without using egg substitutes, please share! So instead, I went with 2/3 the recipe. I loved the addition of yogurt, but fruit yogurt isn’t something I usually buy. So instead I subbed plain yogurt with some of my favorite King Arthur lemon powder. 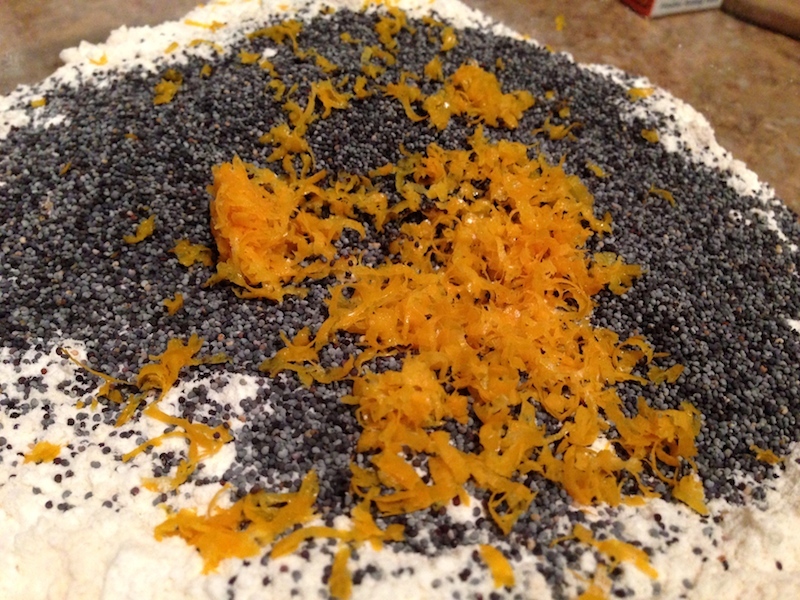 Overall, Traci’s claim of the moistest lemon poppy seed cake is spot on. Preheat oven to 350 degrees. Butter and flour loaf pan and set aside. 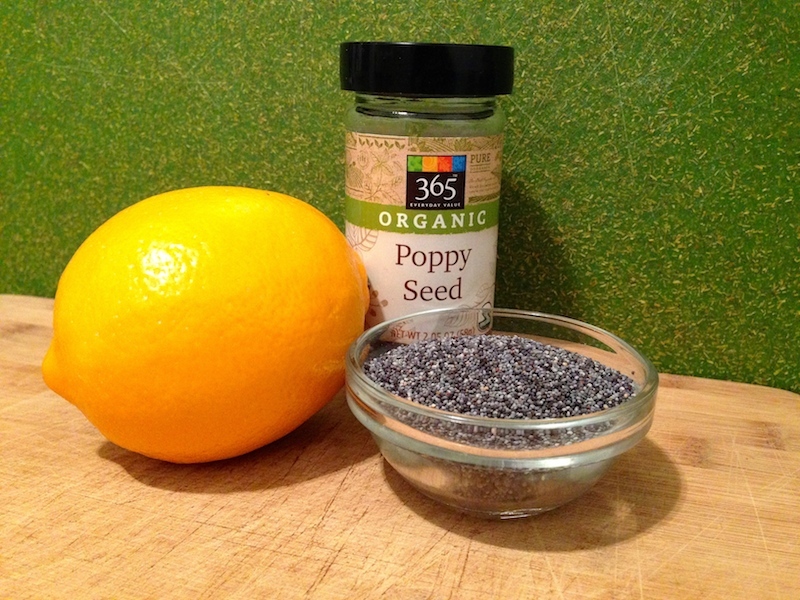 In a small bowl mix together dry ingredients–flours, baking soda, salt, lemon powder and poppy seeds. In a large bowl, beat sugar vanilla and butter until light and fluffy. Add a splash of vanilla and continue mixing. Add eggs, one at a time, mixing well between each addition. Add applesauce, lemon juice, zest and yogurt, mixing until well combined. Slowly mix in the dry ingredients until just incorporated. Pour batter into prepared loaf pan and bake for 50 minutes. Tops of the loaf will brown lightly, and a knife inserted into the center of the loaf will come out clean. Allow to cool for 15 minutes before inverting onto cooling racks. Love a good lemon loaf, and your recreation looks delicious! Nicely done for SRC! Thanks so much! As always, I make the recipe and by the time I post it, I want to make it all over again! What gorgeous flavours, I love lemon anything! Thanks for the great tip! I need to try that next time. What a great list of ingredients. I’ll bet the applesauce keeps it incredibly moist and the lemon and poppy seeds are great flavors in a quick bread! Thanks Renee. I try to sub applesauce for at least half the fat in a lot of baking. It does keep it incredibly moist and has never really altered the flavor of the dish. Beautiful loaf, I also think the combination of poppy seeds with lemon is hard to beat! Great choice for your assignment! Thanks Sally. I love lemon poppy seed. I can’t believe this is my first time actually baking the combination on my own! 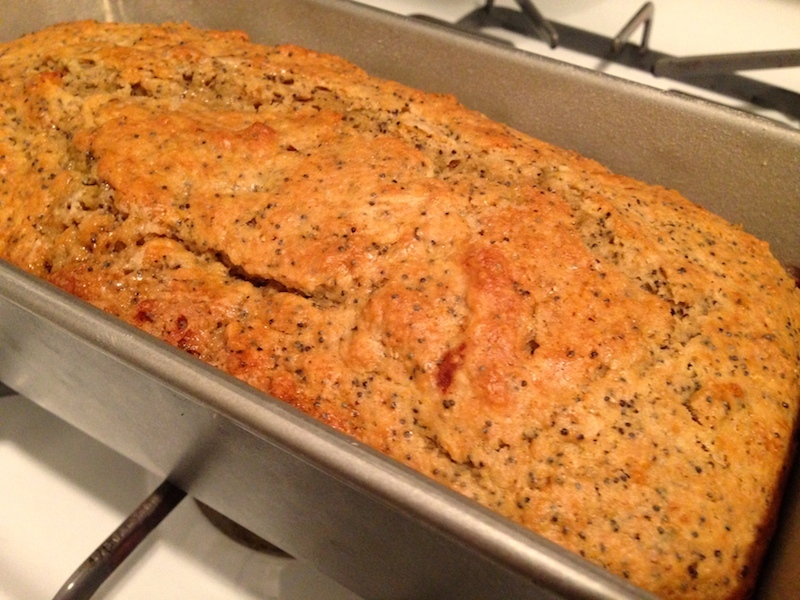 Mmmm… I love lemon poppyseed bread! So good!! Great SRC pick this month! Great pick! Reminds me that I have only added poppy seeds to pasta and haven’t actually baked with them yet. Definitely need to try. I have halved an egg a few times- mostly for breakfast baked goods when I don’t need 20 muffins for myself. I crack the egg into a small bowl and carefully add 1/2 of it to the recipe-half the yolk, half the egg whites. I have a ton of lemons from a friend’s tree, so I’ll have to put this one on my to-do list! Looks delicious. This looks so delicious! I’m with JJ on the splitting of the egg. I scramble them all, weigh them (I’m a big advocate of using a scale in baking), and then pour off half and save the rest for breakfast! Great pick! YUM! 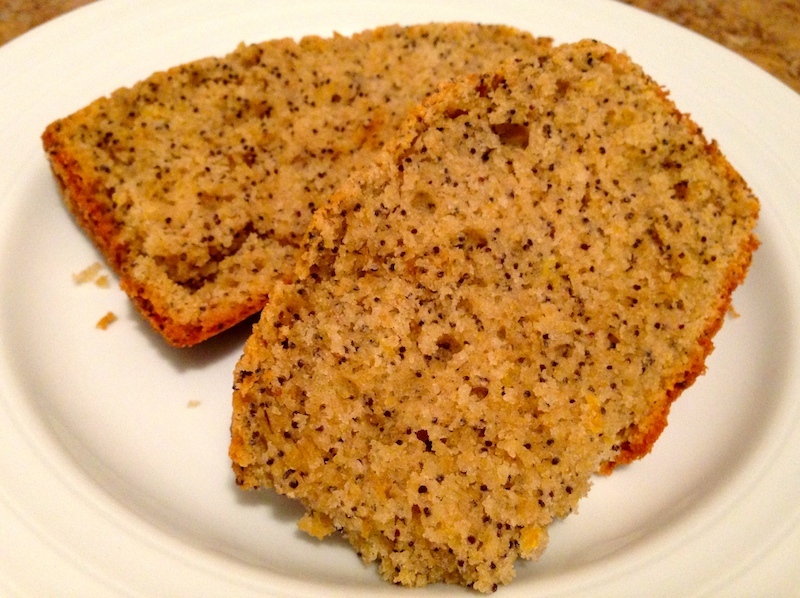 LOVE lemon poppyseed bread! Haha, I know! Thanks for visiting Kristin! I’ve never baked anything with lemon and poppyseed but I do love eating lemon poppyseed muffins from my local cafe. I think that I need to make this gorgeous loaf so I can eat lemon poppyseed goodness at home also! Looks delicious Mel. Great post! Thanks Laura. That was my thinking too. I love eating lemon poppy seed muffins and bread. Is it really try I’ve never baked it? In fact I realized it was the first time I’ve bought poppy seeds. 1 jar makes about 2 loafs. I’m going need to start buying in bulk now. whenever I get lemon poppyseed muffins/loaf I think of Seinfeld. Anyway, I have not made some in the longest of time. I think that needs to change and since you say this is really moist I’ll try this recipe. Lemon Poppyseed cake is one of my all-time favorite cakes! I’ve got lemons ripening on our tree out back – so I’ve got to make this. Thanks so much for sharing this one this month!! so jealous of your lemon tree!